I am a nurse in a level 3 NICU at a large teaching hospital. I attend deliveries for preterm infants, infants with known defects, meconium, etc. Several months ago, I went to a delivery that was paged as a “3.” In other words, it was a routine delivery, no signs of fetal distress, etc. We got there and were told it was light mec–we’re not always even called to light meconiums, but we were this time. Fetal heart rate on the monitor looked beautiful all during pushing. Unexpectedly, the baby was born limp, dusky, and no drive to breathe. The pediatric resident and neonatal nurse practitioner checked for meconium below cords, and there was none. We started tactile stim, with no response. We immediately intubated the baby, started PPV via the ET tube, and assessed there to be no heartrate. We then started compressions. At 4.5 minutes of age, patient had a gasp and we were able to auscultate a heart rate of 160. While this went on, we had a code page sent out to the rest of our unit so that our respiratory therapist and neo doc could be there (only an RN, NNP, and resident attend a “3” page delivery). The baby was brought to our unit on a ventilator, umbilical lines were placed, and just as we were getting ready to decide whether or not to body cool the patient for suspected HIE, he self-extubated and looked amazingly well by about 45 minutes of age. We dodged a bullet, and the baby most likely will be FINE! 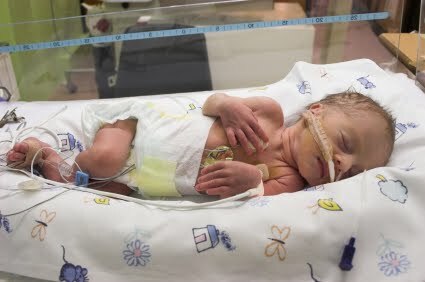 He will be in NICU for a day or two for observation and antibiotics, but should be able to go home with mom. This is even more remarkable when apgars at 1, 5, and 10 minutes of age were 0, 2, & 4. There were absolutely NO indications–ever–that the baby was ever in distress. The meconium was light and there was no meconium below cord. There were no signs of distress in the baby ever noted during labor/delivery. NO ONE knows why the baby did what it did. It took an entire staff of trained professionals to stabilize her–even the best CNM can’t intubate, bag, and do compressions at the same time. That baby, had she been born at home, would have died. A totally normal, low-risk delivery, turned into an almost terrible catastrophe in the blink of an eye. Instead of a dead baby, I left a baby that was pink, breathing on his own, and looking amazing. For people who claim that OBs and L&D nurses are heartless, they should’ve seen the look on the OB’s faces in the delivery room as they watched everything happen and then again when they came to the unit. These people truly care about their patients and want to do everything possible to ensure a healthy baby/healthy mom. ← Is there any limit to what midwives will do to demonize C-sections?